Yuki Oikawa talks to Alexander “The Engineer” Lim, host of AuthorStory by alvinwriter.com about Master Ryuho Okawa’s book, The Laws of Justice: How We Can Solve World Conflicts & Bring Peace. Master Ryuho Okawa is a best selling author who writes on various topics, including lifestyle, spiritual and political issues, and is the founder of Happy Science, which is a spiritual movement, based on Buddhist principles but which also includes other religious principles, that was founded thirty years ago, in Japan. The subject of The Laws of Justice is politics, but one which has a uniquely spiritual viewpoint, and Happy Science itself also runs schools in Japan and has recently created a political party, the Happiness Realization Party, likewise also in Japan. Yuki himself used to work in Merrill Lynch in New York, then joined a financial company in London, both in the capacity of a financial consultant, and it was then that he, as a Protestant, found Master Okawa’s books, became intrigued with the teachings and then joined Happy Science itself. 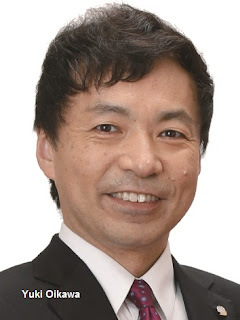 He is presently the international director for the Happiness Realization Party. Although raised as a Christian, he became aware of various other spiritual views. The Laws of Justice takes note of all the conflicts that are presently ongoing in the world, and Master Okawa wrote it with the thought of getting back to the starting point of what justice is, which should come from God’s will. Although the book covers politics, it is directed more towards ordinary people so they could understand politics from a spiritual context. Yuki points out, as an example, that Christians don’t have enough knowledge about Islam to understand it, and vice versa, that solving the problem of conflict between the two religions requires one to open one’s mind, and that justice is essentially an awareness of what is right and what is wrong from the point of view of God’s will. That said, the book doesn’t specifically state any particular laws of justice but is more of a way for a reader to discover the laws of justice on one’s own, through meditation and similar spiritual practices, as Master Okawa believes that, by finding the answers on one’s own - and Yuki admits that finding such answers isn’t easy - one can achieve peace and, from there, help humanity progress towards international harmony. Yuki then ventured that there may be no such thing as absolute right or wrong, but that we need to seek better answers to better divine God’s will. He also noted that the human mind is not perfect and is full of negative thoughts, and that we human beings have the tremendous potential hidden within our minds and the ability to develop this, which is where mediation can come into play. He then ventured a bit into the present issues around Asia and the United States, and where the American election of November 8, 2016 is concerned, he ventured that Donald Trump would be a better American president where Asia is concerned, as Hillary Clinton would maintain the status quo, which would be detrimental to Asia particularly where China is concerned, and Japan is presently concerned with North Korea and extremist groups in Asia. He also favors Trump to create a new relationship with Putin, particularly where Japan’s imminent signing of a peace treaty with Russia is concerned, as Putin seems to regard Japan in a friendly light. To anyone who desires justice, particularly when it comes to redressing a wrong suffered, Yuki would say that God is still alive, and that God loves that person, to remind one of god’s existence. 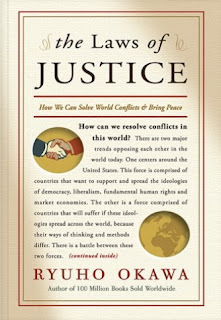 Master Ryuho Okawa’s website for, The Laws of Justice: How We Can Solve World Conflicts & Bring Peace, is okawabooks.com.